Ende Gelände blocked the Hambach coal mine today, the German energy giant RWE had to stop three excavators and one conveyor belt. Ende Gelände action sends out powerful signal for an immediate exit from coal in the run-up to the 23rd UN climate summit. 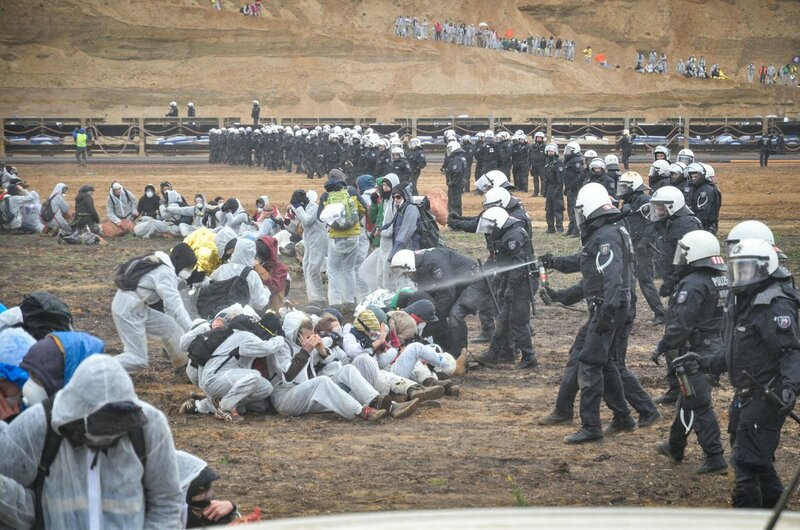 Image: Ende Gelände activists blocked the Hambach coal mine today. Image by @15MBcn_int. Buir, Germany, November 5th 2017: In the early afternoon, thousands of climate activists from the Ende Gelände alliance successfully entered the Hambach open-pit mine at different spots. Using their bodies, they are successfully blocking coal infrastructure to put their call for an immediate coal phase-out into practice. Consequentially, energy company RWE had to stop the operation of three coal excavators and of one conveyor belt in the open-pit lignite mine. “We are part of an international grassroots movement demanding a global energy transition from below. Fossil fuels must stay in the ground. We are here at the scene of destruction to send out a clear signal for climate justice. Together we are many, together we are determined and strong,” said Janna Aljets, spokesperson of Ende Gelände. This morning, around 4.500 people participated in an authorized rally for climate justice, starting in the Rhenish town Buir. In due time, activists from the alliance “Ende Gelände” left the demonstration and set out to block the infrastructure of the Hambach open-pit mine. They are supported in solidarity by a number of national and international climate activists, including the Pacific Climate Warriors, a group of climate protection advocates from various Pacific Island States. Yesterday, Saturday the 4th, 25.000 people took to the streets of Bonn, demonstrating under the slogan “Protect the climate – stop coal”, demanding climate justice and an exit from coal. These activities take place in the run-up to the United Nations Climate Conference (COP23) in Bonn, a few miles from the Hambach open-pit mine. Its presidency is held by the island state of Fiji, which has been hit hard by the impacts of runaway climate change. Previous post: #Philly #J20 Rally for Solidarity!